While people from around the world line up to move to and settle in countries like Canada and Australia, there are also those who love to travel the world, working their way through some of the favourite spots on the planet: including of course, Canada and Australia. As part 2 of our Canada vs. Australia series on choosing where to travel to, we are pleased to bring you another contrast between two great cities: Adelaide, South Australia vs. Montreal, Quebec. You actually should put PQ – as in La Province du Quebec – rather than just Quebec. And no free prizes for guessing what language that’s in. But as you’ll see, you can get by with English in Montreal, even if French tends to be de rigueur for most employment in Quebec. And if studying up on your tenses en francais has you a little flustered, you can always chill with a nice wine at some cosmopolitan establishment in cultured-vibrant-kind-of-European Montreal. Say a robust Cabernet Sauvignon from the Barossa Valley north of Adelaide. Or just enjoy a brew, which we will have a little to say about further on. So let’s do it! Adelaide – the city Australians love to hate until they move there and end up loving it – vs. Montreal – the city that loves to hate Toronto, until they move there and end up kind-of-liking-it. Or if you like: the city that gave the world Leonard Cohen vs. the city that gave the world (ok, so he was born in Scotland like half of Oz’s rockers) Jimmy Barnes of Cold Chisel and solo fame. Okay, So Where Do I Go? Adelaide or Montreal? Just like Sydney, Adelaide is a long way away from most destinations, but to be fair we diversified our starting points to reflect one city each from Europe (London) Asia (Taipei) and the Americas (Santiago de Chile). All are in countries that have international agreements with Canada on youth mobility, managed by IEC Canada. Australia has reciprocal Working Holiday arrangements in effect with the UK and Taiwan, and citizens of Chile can apply for a work and holiday visa, subclass 462. It also evens out some of the flying time comparisons between Adelaide and Montreal. The prices were quoted on skyscanner.net on September 18, 2019 and are for information purposes only. Prices of flights can and do change depending on the price of oil, whether in high or low season, and multiple other factors which we won’t bore you with not being aviation experts ourselves. Please consult with your travel agency and/or Emirates, Air France, Delta, and Air Canada, or any other airline, like Quantas for example. Both Adelaide and Montreal are relatively cheaper, in terms of average rent paid, than their sibling cities in Australia and Canada, but Montreal definitely wins in the rent bargain battle. It’s been a relatively cheap city in terms of rent and house prices for a few decades now, and is notably cheaper than cities like Toronto and Vancouver, or Calgary for that matter, although not quite the deal it was a decade and a half ago. Statistics Canada reports that Canada’s unemployment rate as of August 2014, stood at 7.0%. Canada’s strong economic performance has slowed a little in the last few months, but hardly enough to be worrying. Quebec’s rate sits at 8.1%, a little softer than Ontario’s rate of 7.5% but way better than Newfoundland & Labrador’s 12.4%. Montreal’s economy is based on commerce, industry, finance, technology (including biotech) as well as culture and world affairs. The latter means policy wonks gathering in conference centres. Not to your liking? Not interested in being an acrobat with Cirque du Soleil? Ok, let’s try hospitality and the trades. Ok, we can’t skate around this issue any more. Vous devez parler français aussi bien si vous travaillez en Québec. Translation : You have to speak at least some French if you want to work in Quebec. You can go shopping in English quite easily in Montreal, but most jobs do require French. It is not hopeless if English is your only language, however. There are pubs in English speaking areas and some retail businesses may hire you as an Anglophone (an undercover reporter for Quebec TV exposed that fact) but the trades will likely be trickier. Quebec labour unions are nationalistic, and we don’t mean singing “O Canada”. It is Montreal’s Achilles Heel, unquestionably, and one of the reasons rents are so cheap, all kidding aside. 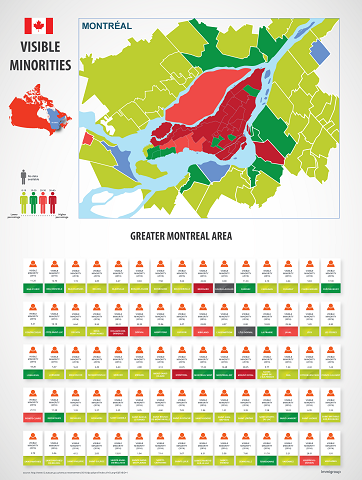 But remember, Montreal is a diverse city with lots of migrants from around the world speaking atrocious French, so take some lessons and vas-y! No such worries about language in Adelaide, it goes without saying. Australia’s unemployment rate in August 2014, was a trim 6.1% according to the Australian Bureau of Statistics. Unfortunately, South Australia is currently battling it out with Tasmania for the dubious honour of having the highest unemployment rate in Oz, all the way up to, um, 7.1%, a rate much of Europe would love to have. Not only that, some think tanks claim that South Australia and Adelaide with their low population growth rates do not suffer the housing boom s and busts that occur in Melbourne and Sydney and are stable welcoming places to work and live. And finally, Adelaide itself, including the surrounding hills area, has a rate closer to 5%. Adelaide has a balanced economy with Defence, Manufacturing, Health Care, Social Services, Retail, and High Tech Electronics among others. Here then is a comparison of some jobs in the two cities. Unless you plan to work under the table and pretend that you’re just visiting for a while – and this is not a recommendable strategy nowadays – then you will have to apply for an SIN, or Social Insurance Number, and start paying taxes. Not only that, you’ll be paying taxes in Quebec, which is generally a case apart as far as Canada goes. Quebec, like some other provinces, has an HST, or harmonized sales tax that combines the provincial sales tax, QST, with the federal sales tax, GST. You will also have to pay income tax, both provincial and federal. Both income taxes are deducted from your pay-cheque. However there is also a non-refundable tax credit called the basic personal amount. In Quebec, the basic personal amount for Tax Year 2017 is $14,890. This amount is multiplied by the lowest tax rate (15%) to then give you a tax credit. Essentially, what it does is make the first $14,890 of income tax free. As a visitor, and thus a non-resident, working in Canada you must adjust your basic personal amount by the amount of time you worked in Canada. In other words, if you only worked 6 months of the year, you can only use half of the basic personal amount. 15% on the first $46,605 of taxable income – remember that your first $14,890 is tax-free due to your basic personal amount. 20.5% of taxable income above $46,605 up to $93,208. 26% of taxable income above $93,208 up to $144,489. 29% of taxable income above $144,489 to $205,842. 33% of taxable income above $205,842. 15% on taxable income of less than $43,055. 20% on taxable income above $43,055 but not more than $86,105. 24% on taxable income above $86,105 but not more than $104,765. 24.75% on taxable income above 104,765. Before you get scared adding up tax rates, remember the basic personal amount. To give you an example by going here you can calculate your combined federal and Quebec income taxes. For an income of C$30,000 you get total income taxes, both federal and provincial, of C$5,628.90 which is an average tax rate of 18.76%. The Canadian tax year is the same as the calendar year. In Australia you will have to apply for a tax file number (TFN) so tax authorities can hunt you down if necessary. It also identifies you for tax-filing purposes. The sales tax in Oz is 10% and is incorporated into the price of most goods. As a visitor on a working stay in Australia, your taxes will depend on whether or not the Australian Tax Office (ATO) classifies you as an Australian resident for tax purposes only or as a foreign resident. Essentially, you have to spend most if not all of the year in Australia and have a continuous work experience in a settled location to be classified as Australian. They will decide based on your specific situation. The Australian tax year runs from July 1 through June 30. Note: There are also low income and low and medium income "tax offsets" which reduce the taxes you pay if you qualify. Learn more here. Click here for a map of the Adelaide Metro. Click here for a map of the Montreal Metro. Adelaide’s Metro consists of bus, train, and tram networks while Montreal’s Metro (Societe de Transport de Montreal or STM) consists of the metro, or subway, itself as well as bus lines. Montreal’s fare schedule is fairly straightforward, while Adelaide’s is a bureaucratic tangle of times and classes of tickets, of which we only provide a sample here to give you a flavour of what deciphering your ticket price in Adelaide involves. Believe it or not, there are even more options available as regards the Adelaide Metro ticket pricing system. The sample above should be enough, we feel. Canada vs the USA - Where should I go: LA or Vancouver? Canada vs Australia - Where should I go: Melbourne or Vancouver? In the Economist Intelligence Unit’s 2014 ranking of world cities in terms of livability, Adelaide comes in at a world class number 5, between Toronto and Calgary. This is good because in summer in Adelaide, you can occasionally enjoy world class temperatures at around 45 C°. Summers are hot in Adelaide because the city is in a hot-summer Mediterranean Koppen Classification. It has mild winters and hot dry summers, just on the boundary of being semi-arid. Montreal comes in behind Adelaide at number 16 in the EIU livability survey, between Paris and Stockholm. This makes sense, seeing in Montreal you get to speak French in the middle of freezing winters. And to be fair to Stockholm, they have milder winters. Montreal is on the boundary of hot-summer humid continental and warm-summer humid continental in the Koppen classification system. Summers in Montreal tend to be short and sweet with a few really hot spells, but winter is cold, snowy, windy, and icy. In this case, Adelaide ends up being just a touch more restricted than Montreal and Quebec, which compared to Ontario, enjoys far more liberal liquor and beer laws and late closing times (3AM is closing time in Montreal with last call at 2:50 AM). While Quebec has its SAQ, (Societe des alcools du Quebec) for its government-run liquor stores, you can buy beer at grocery stores and the legal drinking age is 18, the same as in Australia. South Australia’s 1997 Liquor Licensing Act seems to leave a reasonable amount of discretion to bar owners and beer is fairly easy to buy. Closing times, however, are a bit of an issue. In 1967, South Australia extended closing time from 6 PM – yes 6 PM – all the way to 10 PM. Closing times are a little later, but not much, nowadays. Here then, in the vital field of beer and pubs, is a comparison of two establishments, one in each of our cities. The P.J. O’Brien’s in Adelaide closed. So we've selected Mick O'Shea's as a replacement. Montreal, being Montreal, offers you Le Vieux Dublin (as in old, not as in view). Both charming establishments with a nice selection on tap and great food. Here’s a sample. Le Vieux Dublin is at 636 Rue Cathcart, strategically located between McGill University and Parc St. Patrick. Mick O'Shea's is located on Main South Road in Hackham, south of downtown. If you can’t buy all your fav brands “from glorious home country”, you can always buy cheap and in bulk. Here’s a list of your basic needs when shopping. Nostalgia not included. Prices may change and were quoted May 3, 2014. Your most important accessory and multimedia, international, jet-setting communications tool is vibrating in your pocket. Did we mention it might be your digital wallet as well? Choosing a mobile provider and plan can be a little complex, especially seeing there is a nice variety of competing choices in both cities. In the earlier version of this article we hunkered down and simplified it for you, using a very up-to-date, early-adopter screening process to bring everything into high resolution focus: both companies start with the letter V. The feisty Videotron in Quebec. The feisty Virgin Mobile in Adelaide. But Virgin is turning into Optus for some reason. So we're going with them. If you’ve been following our series you know that Toronto was 5 hours behind London. Know that Montreal is also EST and 5 hours behind. You also know that Sydney is 9 hours ahead of London and in this case, Adelaide is 8 ½ ahead of London. In spring and fall, however, daylight savings changes can make comparisons a little tricky for a week or two. So let’s put up that Footy-watching chart again so you can compare what it’s like watching your favourite team in each city with a coffee or a brew in hand, or both, depending on the local time. Champions League 4:15 AM Save a brew in the fridge for the start of the match, then switch to coffee for the closing minutes. 2:45 PM Depending on how late you stayed up, coffee and then beer, or straight to a beer. Six Nations (2 PM local start) 10:30 PM You have 90 minutes to closing. Drink up. 9 AM Even if it is rugby, best to go with a coffee, then switch to beer as 11 AM approaches. Heineken Cup (2PM local start) 10:30 PM You have 90 minutes to closing, and the words ‘Heineken Cup’ keep flashing on the screen. Drink up. 9 AM Even if the tourney is sponsored by Heineken, you might start with a coffee and switch to beer in the 2nd half. X-files reruns Channel Ten started running them in 2008. If no longer on 10 HD, then stream on Netflix. Go straight to the brew, turn down the lights, and ogle Scully, or Fox. Or both. Stream them on Netflix and start with coffee and then switch to beer. Turn down the lights and groove to the theme song if you’re alone. Which you probably are. Both Australia and Canada have programs for young people, usually between the ages of 18 and 35 (although this can vary a little in some cases) from countries around the world for which they have signed agreements with. In Australia you apply for a Working Holiday visa, (subclass 417). Go here for more information. In Canada, the International Experience Canada is a similar program and available to young people from a variety of countries. The visa, if applied for online, will cost you A$420 and is valid for 1 year. You will also need AUD$5,000 in personal funds and have health insurance and submit a clean police record. Note that each country has a particular quota of spaces available in any given year and you should check on your country’s quota to see whether any spaces are left. Always apply as soon as possible to ensure you have a place. You may be able to apply later for Permanent Residence depending on factors like work experience and education, primarily, although others, like family ties, may be taken into consideration. Another route is to find a job offer with a potential long-term employer in Canada. Your employer first must apply for a Labour Market Impact Assessment (LMIA), and if your employer receives a positive LMIA, then you can apply for a work permit for up to 4 years (after your 24 month working holiday).